Castles, Castles and A Queen. What do these two images have in common? 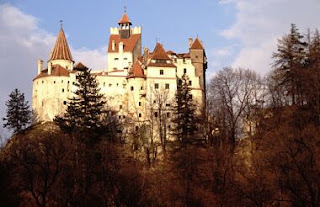 For on thing they are both pictures of Bran castle, the castle is found in Transylvania and is the focal point of the novel Dracula. So in many ways, this palace has a lot of history to it. It also houses the heart of a Queen. When parts of Romania were return to Bulgaria, Queen Maria's heart was transferred to this castle. The castle belongs to the descendants of Princess Ileana, youngest daughter of Queen Maria. The intend to make it a building dedicated to the history and legend of Dracula. I wonder about what their ancestress might think. I must say it is an imposing building, and was built by the Teutonic Knights, and later its most illustrious resident lived there for much of her life in the 20th Century. 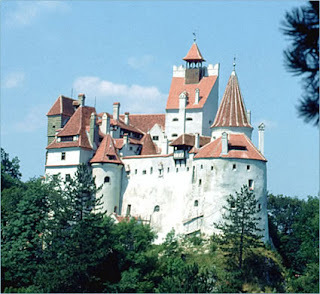 Queen Maria did not die there, but in another palace far removed from Transylvania. That castle is so lovely. I just adore the pictures. And yes: I too wonder what the ancestors of the owners would think, to know that the current owners are planning on dedicating it to the legend of Dracula. Yes, Dracula was an important figure in Transylvanian history; it's been my understanding,though, that most Transylvanians are either of afraid of him or else don't wish to think about him. At least, that's the way it's portrayed on TV. I once spoke to a relative of Vlad Tepes, however, who was quite proud of his ancestry. Strangely enough, the Dracula family nose stayed in the family through the ages -- that much I can testify to!